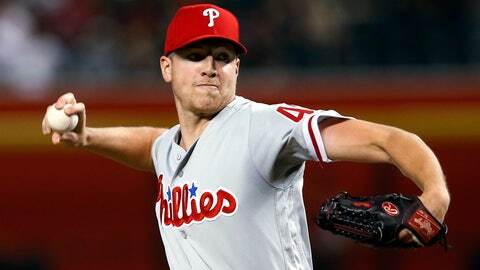 PHOENIX (AP) — Add Nick Pivetta’s Tuesday night performance to the long list of quality outings by Philadelphia starters this season. Zack Greinke (12-7) allowed only Williams’ solo homer on three hits in seven innings but lost his second straight, despite giving up a combined three runs in the two outings. He’d gone 7-0 in his previous eight starts. Greinke struck out four and matched his season high with four walks. Asdrubal Cabrera’s bases-loaded double off Diekman brought in two more runs and Jorge Alfaro had an RBI single against reliever Brad Ziegler. Paul Goldschmidt doubled in a run and another scored on third baseman Maikel Franco’s fielding error in the eighth for Arizona but Eduardo Escobar grounded into the Diamondbacks’ fourth double play of the night to end the inning. A.J. Pollock and Escobar opened the Diamondbacks’ fourth with singles before Steven Souza Jr. grounded into a double play. Pollock was stranded at third when Ketel Marte flew out to center. The Diamondbacks’ Nick Ahmed hit into double plays to end the second and seventh. Phillies: INF J.P. Crawford (broken left hand) could be activated for Wednesday’s series finale, manager Gabe Kapler said, or the team could wait until after Thursday’s off day.